WASHINGTON—The Obama administration so far is making little progress in getting more young adults to sign up for health policies on the federal insurance exchange, according to figures released Thursday. Twenty-six percent of people who signed up for coverage as of Dec. 26 in the 38 states that use the federal exchange were ages 18 to 34, according to a report from the Centers for Medicare and Medicaid Services, which administers the law. That figure is largely unchanged from a roughly comparable two-month period through Jan. 16, 2015. 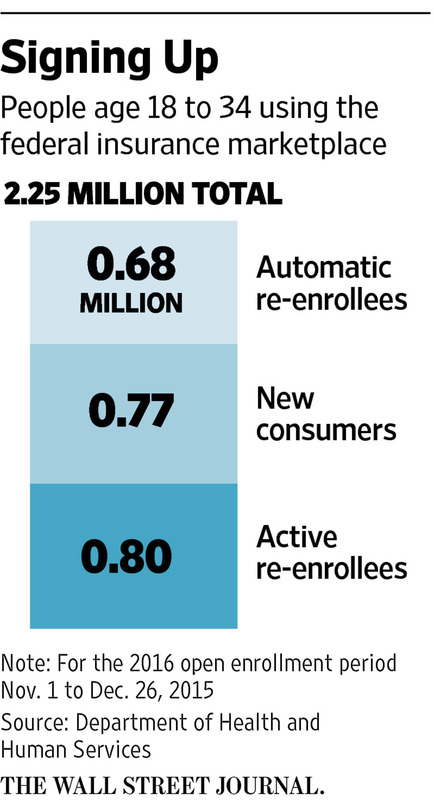 The numbers are below goals set by actuaries when the exchanges were launched in 2013. They estimated then that adults 18 to 34 would ideally make up 40% of the exchanges’ enrollment because the age group is generally healthier—which means they hold down premium rates by balancing out the greater medical spending of older enrollees.